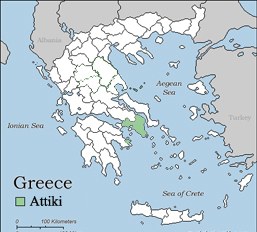 Attica (in Greek: Αττική, Attike;;) is a periphery (subdivision) in Greece, containing Athens, the capital of Greece. Attica is also the only prefecture (nomos) in the periphery of Attica. Attica is located in what is today southern Greece, and covers about 3,800 square kilometers. In addition to Athens, it contains within its area the cities of Peiraeus, Eleusis, Megara, Laurium, and Marathon, as well as a small part of the Peloponnese peninsula and the islands of Salamis, Aegina, Poros, Hydra, Spetses, Kythira, and Antikythira. More than 95% are habitants of the Athens metropolitan area. Athens was originally the capital of Central Greece. This page was last edited on 26 June 2007, at 12:11.